I had a craving for some white chicken chili, so I made some of my delicious Creamy White Chicken Chili tonight. MMMM, was it good! Hubby and I both had seconds and kids gobbled it up too! I usually boil my chicken breast to cook it and then shred it with a fork and knife. You can also cube it, if you prefer it that way. While your chicken is cooking, pour all the canned items (with the juices too- don't drain them!) into a large pot (or crockpot). Add the dry seasonings and stir together. Turn to medium/high and start simmering. Once your chicken is cooked and shredded, add the chicken to the pot. Now, I like my broth a bit creamier so I do a few things to make it less, well, clear. First I take the back of my ladle or a potato masher and press down into the pot so that you can squish some of the beans and corn together. You could also take a bit out and blend it together in the blender or food processor. Then I add a little milk, sour cream, and cream cheese. I just kind of make a guess at this, but I'd say I add about 1/2 C milk, and about 2-3 Tablespoons of sour cream and cream cheese. Let this come to a boil and then simmer for about 1/2 hour. If you're making it in the crock pot, cook on low for 4-6 hours. 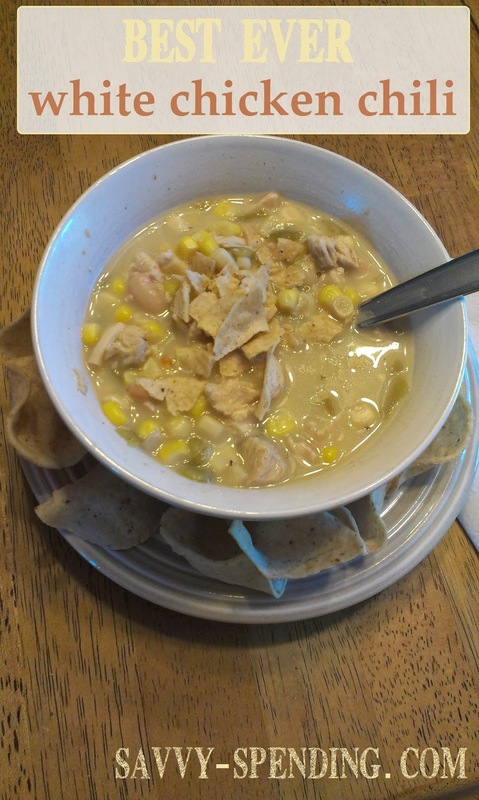 The great thing about White Chicken Chili is it's so versatile! You can add onions to yours if you like, omit the creamy ingredients if you like a clear broth, add more or less spice, etc. I've even heard of some recipes with Greek Yogurt in it! I like to fry up some tortillas and cut them into strips for garnish (or you can use bag tortilla chips). Serve with shredded colby jack cheese and extra sour cream, if you so desire! Perfect for a cool fall day and it's even much better the next day as leftovers for lunch! If you like this recipe, PIN IN so you can come back to it later!